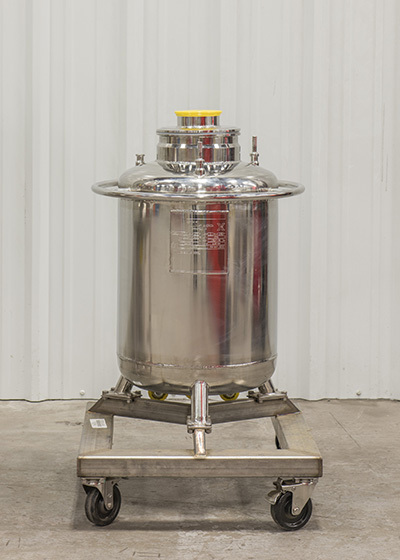 How exactly do our used stainless steel pressure vessels and tanks become HOLLOWAY Certified™? PMI (Positive Material Identification) Testing on product contact materials to confirm proper material identification and certification. Visual interior and exterior surface finish inspection to verify proper finish requirements have been achieved. Profilometer inspection to certify the material and weld finishes are within the original specified requirements. Dye Penetrant weld inspection to ensure proper weld quality. Ultrasonic material thickness inspection to establish that the vessel wall thicknesses meet ASME Code. Vessel Hydrotest to warrant that the vessel maintains its design pressure. Note: Holloway also uses a number of other proprietary inspections to certify that your vessels are operating at peak performance. To learn more, contact a HOLLOWAY AMERICA representative. Notes: This pressure vessel was used briefly. Notes: This vessel is new and has never been put into service.